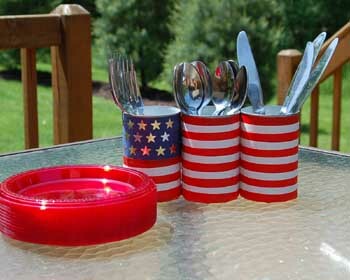 This simple buffet silverware holder adds pizazz and patriotic spirit to your next outdoor barbecue! It is perfect for Memorial Day parties, Fourth of July get togethers, and Labor Day cookouts. 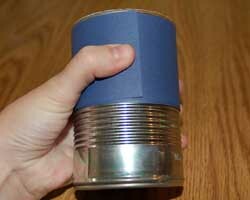 It is very easy to make, a great craft for an older child. 1. 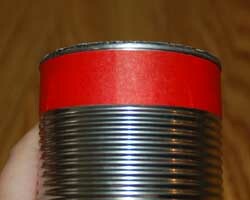 Begin the buffet silverware holder by wrapping the red tape around the top of one of the cans, right underneath the rim. 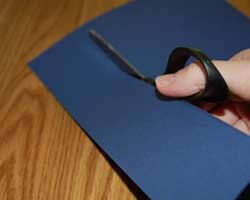 Once it is wrapped around once, trim the tape with the scissors. 2. 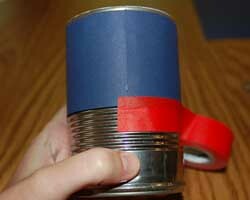 Using the white tape next, overlap the red tape by at least half, and wrap the white tape around the can once. 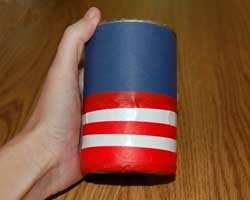 Note: If you want your craft to have the proper amount of stripes the American flag has (13), then you will have to overlap the tape more than half, unless you have larger cans. 3. 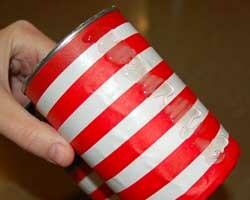 Continue alternating colors of red and white stripes down the can until you reach the bottom. 4. 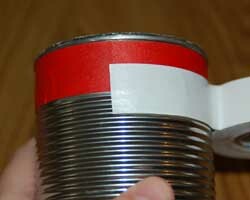 The last stripe probably will not fit exactly, but just fold the remaining tape under the bottom of the can as shown. 5. 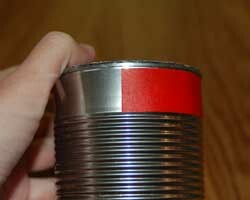 Now that you have one can finished, do the same pattern for another can. 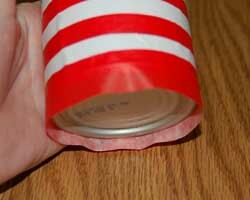 For the third can, you will need to cut a strip of blue cardstock or construction paper to a length that will wrap around the can. The width should the width of the first seven stripes, if you are making the correct American flag. For my craft I had the blue section the width of four stripes. Use your best judgement. 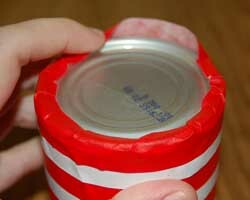 Wrap this around the top of the third can and hot glue in place. 6. Using the next color of tape (in my case red), wrap a piece of tape around the bottom of the blue paper, overlapping it a little to help secure it more. 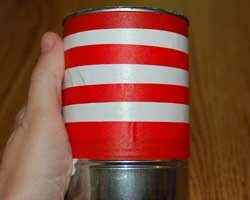 Then continue with the stripes to the bottom, as you did with the other cans. 7. 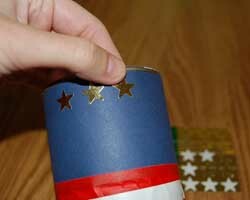 Decorate the blue portion with the silver and/or gold star stickers. 8. 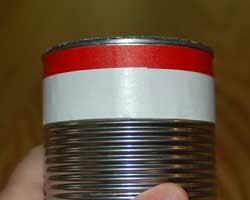 To finish the buffet silverware holder, apply a thick strip of hot glue to the sides of the cans to glue them together in a row, and allow to dry. 9. The buffet silverware holder is now ready for your next summer party!